This recipe is the direct antithesis of “fancy” – which, other than the fact that it’s just plain delicious – is why it’s so awesome. It’s the perfect way to celebrate and enjoy seasonal produce without having to get all fussy and stuff. Chili! And cheese! Hellooo, my pretties. Okay, so they are squash, so they’re actually not the prettiest things in the world. I mean, can anything called “squash” be pretty? But no matter! I promise you – you won’t care in the slightest. I’m totally in love with this recipe. It might be the easiest way ever to convert professed squash haters. 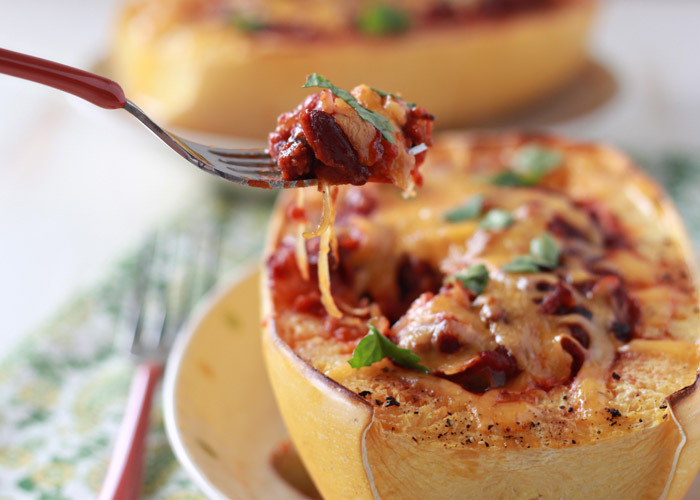 Spaghetti squash is already a great gateway squash. As long as you don’t go into things expecting an exact replica of pasta, you’re likely to be pleasantly surprised. Firm, almost crunchy strands without that “squashy” taste. It’s pretty great. 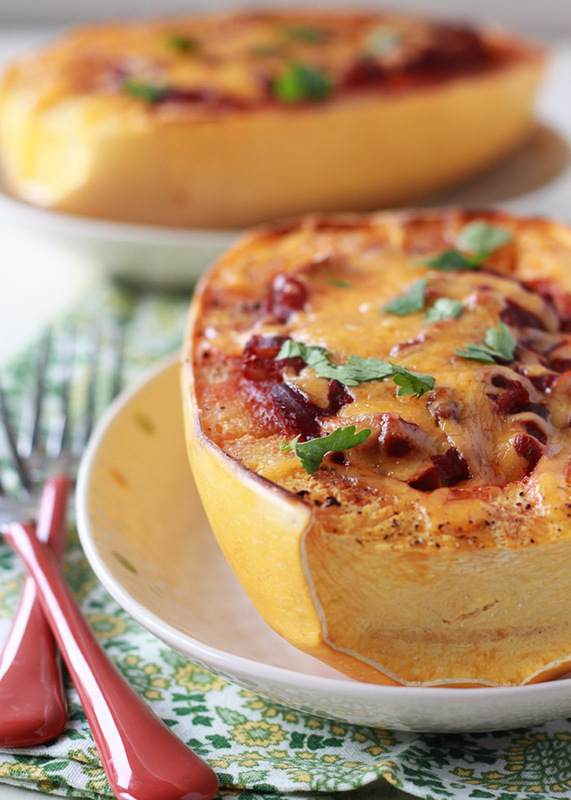 With Chili Cheese Stuffed Spaghetti Squash, the squash sort of stands in for a bread bowl. Except less carbs. 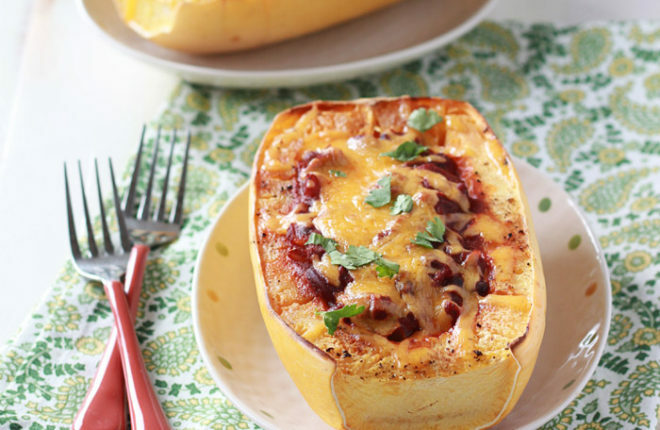 You just roast spaghetti squash halves then fill with chili and cheese, then bake again until melty perfection. That’s pretty much the deal. 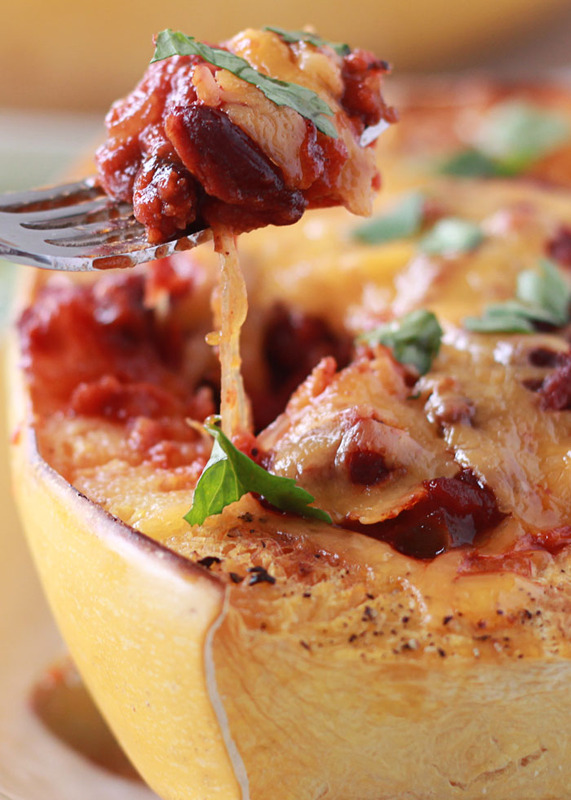 As you eat your cheesy chili, you scrape strands of the delicious squash into each forkful. It’s a good thing. So here’s another cool thing about this dish. I provide a quick and easy chili recipe here, but really, you can use any chili you want. I’ve made it with this Black Bean Pumpkin Chili, for instance, and it was wonderful, though a little strange to eat squash within a squash. Dinner Inception, my guy called it. So make your favorite chili to stuff in there. Or make use of chili leftovers. Or use canned chili! I won’t tell. Or. Or! Make up a meaty version and a non-meaty version. The individual serving component makes it perfect for doing the One Dish Two Ways thing. Nope, fancy-pants it’s not. And that’s just the way we like it. These can be assembled up to the point of baking, then refrigerated for up to 24 hours. Just remove from the fridge and bake! You just might need to cook them for a little longer to heat them all the way through. You can also make each component separately beforehand and then quickly assemble and bake for a faster weeknight dinner. Preheat oven to 375 degrees Fahrenheit. Line one large or two medium rimmed cookie sheets with parchment paper or foil. 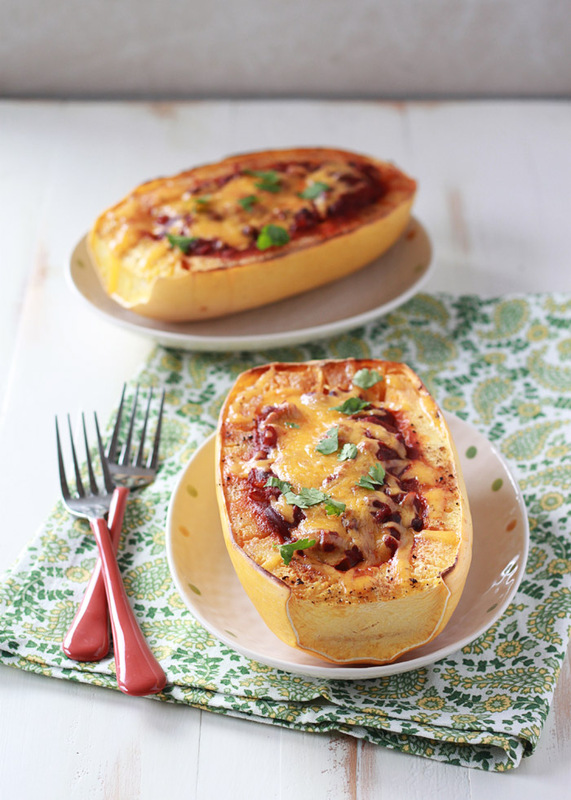 Lop off the top of the spaghetti squash and cut it in half lengthwise. With a spoon, scrape out the seeds. Brush the cut side of each half with 1 tablespoon olive oil. Dust with 1/2 teaspoon salt and 1/8 teaspoon pepper. Place cut-side down on cookie sheet(s) and bake until tender and the squash can easily be pierced with a fork, about 40 minutes. You can also microwave the spaghetti squash if you need dinner on the table faster. Here’s how to cook spaghetti squash in the microwave, along with full instructions on prepping and cooking it both ways. While the spaghetti squash cooks, make the chili. Drizzle 1 tablespoon olive oil into a large saucepan over medium heat. Add the onions, green peppers, and oregano and cook, stirring occasionally, until tender, about 5 minutes. Add the garlic, chili powder, cumin, and cayenne and cook, stirring constantly, for one minute. Add the tomatoes and beans and stir to combine. Cook until it starts to bubble (be careful, it may splatter because it’s so thick) then reduce heat to medium-low and cover. Cook, stirring occasionally, for another 10 minutes, until heated through. Set aside. 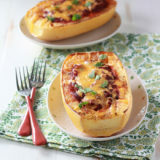 When spaghetti squash are done cooking, flip them over. Sprinkle 1/4 cup of the cheese in the bottom of each half. Fill to the top with chili and top each with remaining cheese. Return to oven and bake until cheese is melted and bubbly, 20-25 minutes. 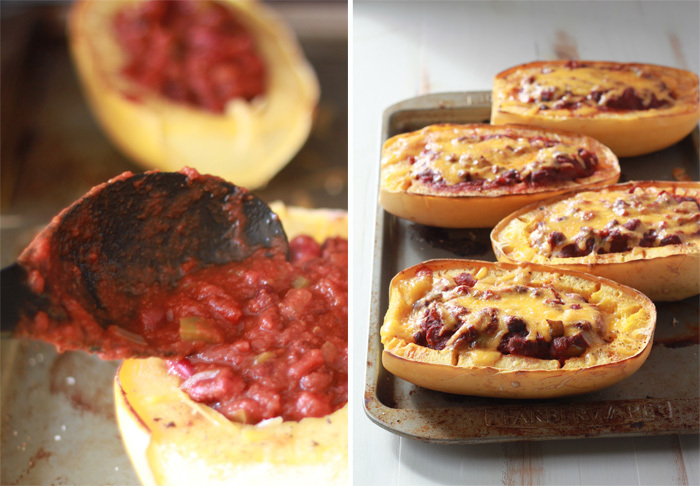 Because spaghetti squash can vary in size, I wrote this recipe so that there will probably be more chili than you can use. Refrigerate or freeze the leftovers for a quick lunch or to top nachos or baked potatoes some other time! Leave off the cheese and other dairy products (or sub vegan products). Ohhhh, totally trying this! And the black bean pumpkin chili is my FAVE!!!!!!!!! i don’t remember the last time I had squash but this does make it look yummy! Is there anything you can recommend in place of the squash though? I had a TERRIBLE time cutting the spaghetti squash (and other winter squashes, too) in half and your pictures make it look so easy. 🙂 My sharp chef’s knife kept getting stuck in the squash and didn’t smoothly slice through it. Any tips? It’s so tough cutting squash! I have a very sharp, very heavy chef’s knife and even then it can be hard. I try to cut off an end so that I have a flat surface to work on, and then if I cut the spaghetti squash lengthwise, once I get the knife in I can push on the back and the front of the knife and sort of rock the knife through. It gets easier with practice but it still feels like you’re risking life and limb sometimes! In response to Kira’s question, it is my understanding that you can precook the squash in the microwave for a short time and that will make it easier to cut before baking it in the oven. Used this idea tonight – I used my vege- chili recipe which is different, but the idea of using the spaghetti squash as a bowl was great. We sliced ours the other way (I half shortwise) which is easier knife skills and serves as a better bowl. Super yum and super fun. Thanks for the idea! Guess what? It didn’t have any meat in it! Thank you, we really enjoyed this recipe.